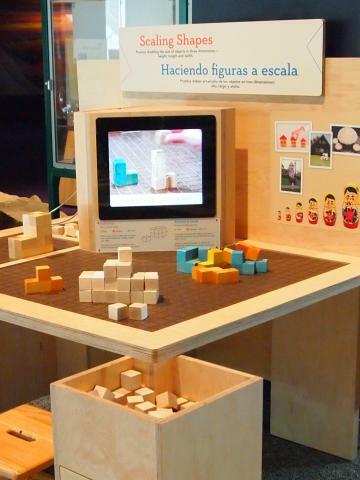 The exhibits provide rich and engaging experiences that 1) encourage children to acquire deep understanding of math concepts, 2) make the practice of math skills surprisingly memorable and enjoyable, and 3) help children identify success with math as personally relevant and rewarding. 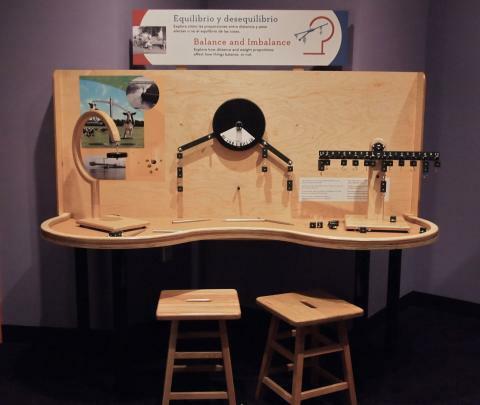 Balance and Imbalance challenges young visitors to hang weights on three types of balances to discover proportions of distance and weights: (a) traditional math education balance, (b) a balance with a circular scale, and (c) a multi-armed balance with a high degree of complexity and open- endedness. An attractive and highly interactive component, learners get an intuitive feel with ratios and proportions. 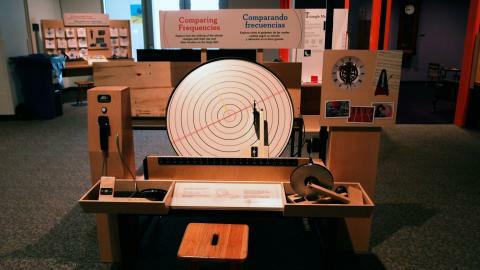 Comparing Frequencies creates rhythmic percussive sounds using one or more small wheels driven by a large wheel. Visitors place small wheels against the larger wheel. Each of the small wheels has a clicker that sounds each time the small disk turns once around. The frequency of the clicks depends on the diameter of the small wheel and on where the wheel contacts the large turning wheel. Users can experiment with several wheels to compare frequencies of the clicks. These learners both see and hear the rhythm of proportions and frequency of clicking. 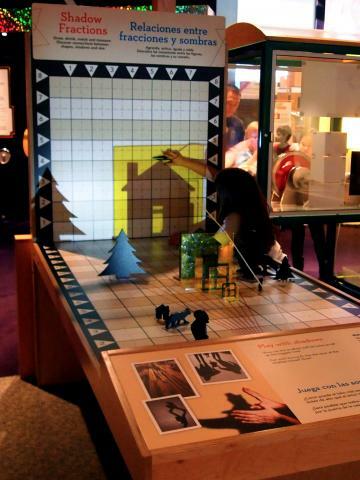 Shadow Fractions invites learners to experiment with the placement of scaled objects to make shadow stories or scenes. A bright-white LED, at table height, casts shadows of the objects on a grid. Grid lines are numbered at the sides and along the top. Each object is copied at three proportional heights: 2” high, 4” high, and 8” high. 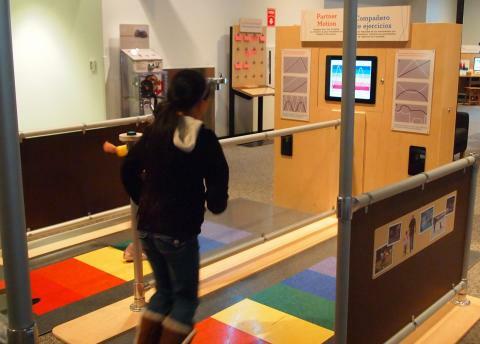 By moving these objects, growing or reducing its size, visitors are directly experiencing physical science. Scaling Shapes lets visitors enlarge simple objects by doubling all three dimensions. By introducing concepts of volume and three-dimensionality, this challenging exhibit is a good companion piece to the Comparing Forms exhibit and extends the study of scaling, similarity, and proportionality. 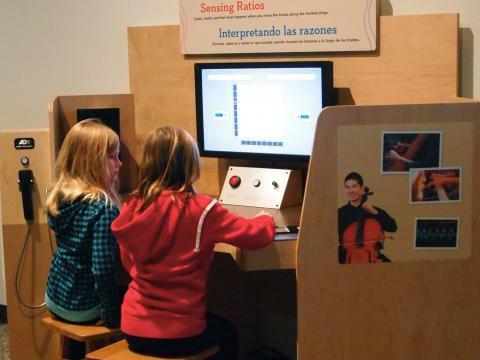 Sensing Ratios is designed to explore ratios by hearing tones or sounds as well as in seeing. Visitors move red knobs at the left and right side of the exhibit that control tone generators. The positions of the knobs are graphed on the screen, the left knob on the y-axis and the right knob on the x-axis. A phone at the left also supplies an audio description. Users are able to use the exhibit with their eyes closed – for instance, making a stair-step pattern by adjusting the tones first to come into unison and then moving one of the knobs up until the tones are an octave apart. Partner Motion provides visitors with an opportunity to see how their rate of motion affects a graph on a screen. Walking back and forth, slowly and quickly, users create graphs of their motions. An experimenter can also work with a partner to create a number of different graph shapes. The graphs on screen and on paper display their movement over time, giving them direct proportional slopes, another way to think about and feel how their rates compare. 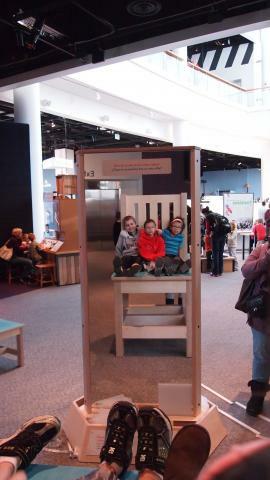 Comparing Forms has visitors sit in three chairs that are identical in every aspect except proportional scale. One chair is full scale (X), the other chairs are 1/2X, and 2X. A truly physical experience, learners use their body and other measuring tools to investigate how the chairs differ in size. They tangibly gain experience with scale models and the geometric concept of similarity, and begin to understand proportional relationships between different-sized objects. 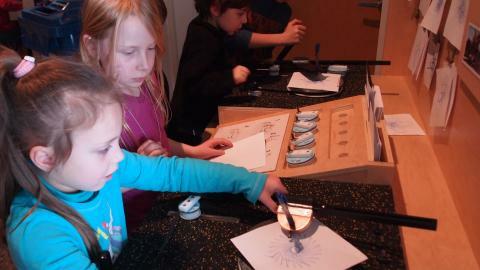 Drawing with Gears is a mechanical drawing table where visitors draw harmonic patterns using proportional wheels. The device uses several interchangeable gears at a time, one or more of which may be selected by the visitor. The drawn patterns repeat after a fixed number of rotations of the platen, and the patterns are determined by the ratio of the gears used at a particular time. Learners produce complex, circular drawings on paper they can take home or post on the component.